A German Cup first round game between Hansa Rostock and Hertha Berlin on Monday night was halted twice due to fan trouble. 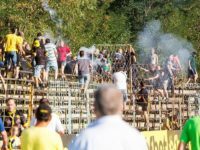 Blau-Weiss Linz and Ried fans briefly clashed in the stands at the end of their Erste Liga match on Friday. Aberdeen fans clashed with stewards and riot cops after the Scottish club's 2-0 defeat at Apollon Limassol in Larnaca last night.